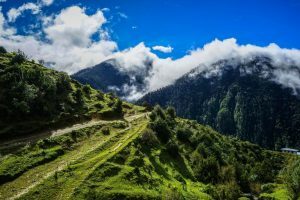 Bhutan is an exotic destination. 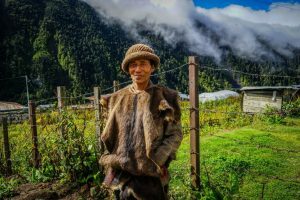 Wedged in between Tibet, Sikkim, and India, this Buddhist Kingdom has retained its culture through strict law; put in place to keep globalisation away. Upon arriving here, you will feel as if you have arrived on another planet. 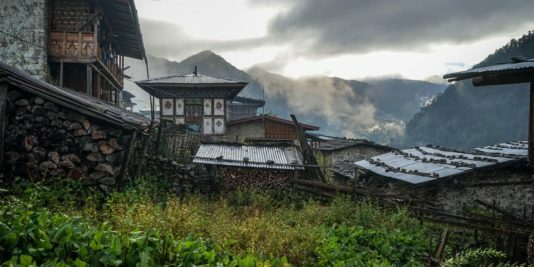 Head to Bhutan’s East, and you will discover another galaxy. 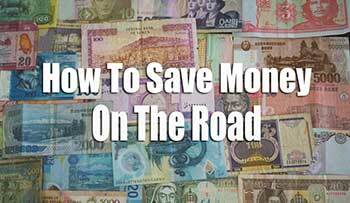 From Thimphu, Bhutan’s capital city, you will need to drive two days east to Trashigang. Passing through high altitude mountain passes and remote valleys is pure magic. The noise of the modern world are replaced by the wind in the mountains, and the air is absolutely pristine. This is a world untouched by modernisation. 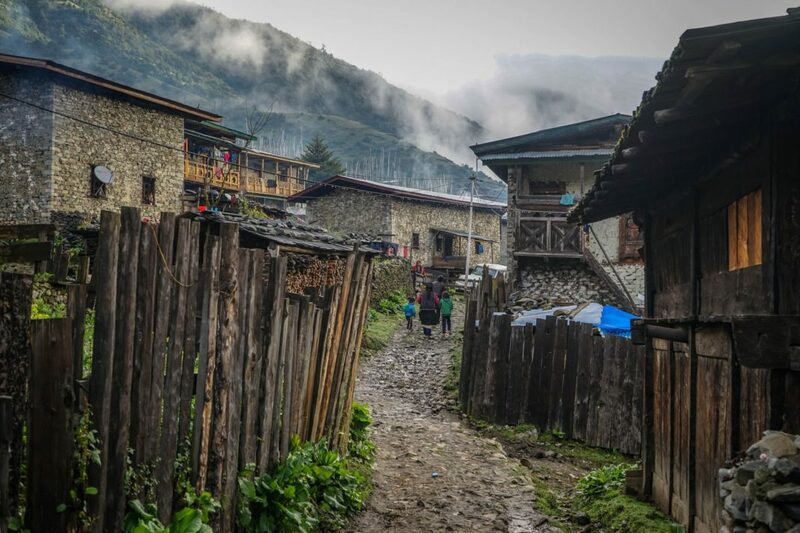 Trashigang is a traditional Bhutanese community that hangs onto the side of a mountain. Other than a few bars, stores and hotels, there is not much here. The Dzong* towers, high above the town, are indicative of the wealth and power that once flourished in the region. *Dzong – A medieval fortress built to control trade and taxes. These fortresses guarded the treasuries and royal families of the regions, similar to european castles. 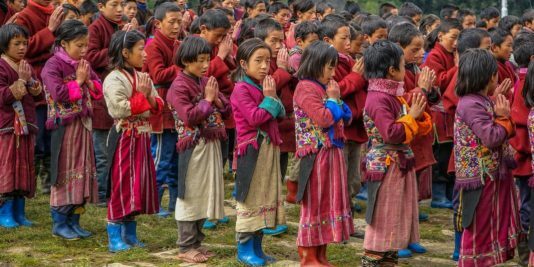 Today, Dzongs still play a very important role in Bhutanese society are still used regularly, housing all the political and provincial offices. Trashigang was the last pit stop for my guide, Sonam, and I, before heading into the mountains in search of the Brokpa people. Sonam was born in Punakha, a city located on the other side of Bhutan. He, also, was new to this area and had no idea what to expect. This 741 sq. 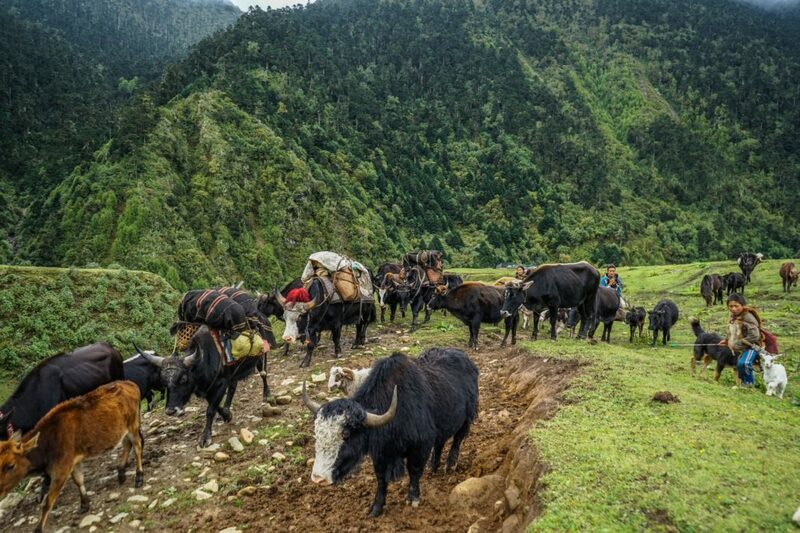 km park is the only National Park on earth that protects the natural habitat of the Yeti or, as locals call it, the Migoi. The park is one of the county’s top attractions. It is home to many species of rhododendrons. 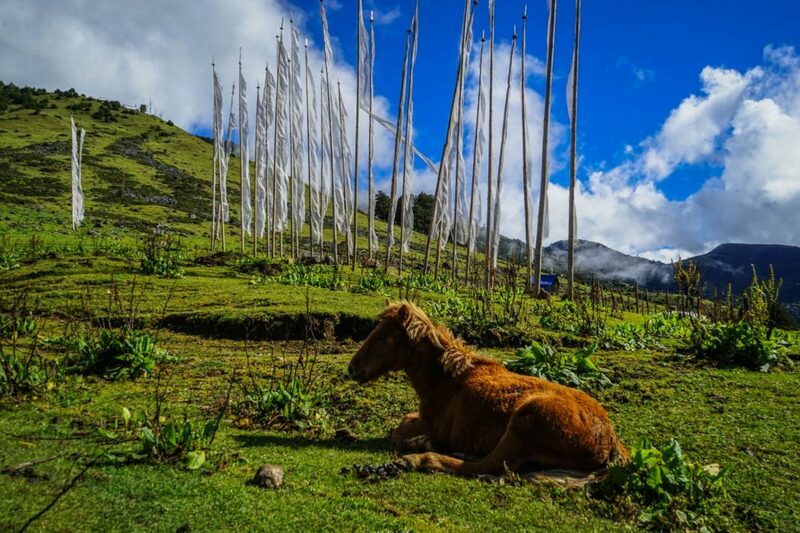 If you are lucky you might spot some of Bhutan’s endangered species such as the Himalayan red fox, red panda, and the black bear. This park is where the Merak to Sakteng trek’s located. Rare sightings of the snow leopard have occurred here. In fact, this is one of the best places in the world to see them. 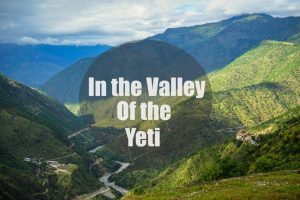 Unfortunately, the number of sightings has dropped quite a bit, and it seems that the locals have seen more of the Yeti than the snow leopard! 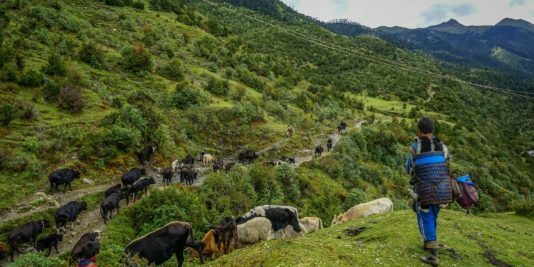 Sakteng Wildlife Sanctuary has only been open to foreigners since 2010, The area definitely has a Far East remote Bhutan feel to it. We set out in the early morning. 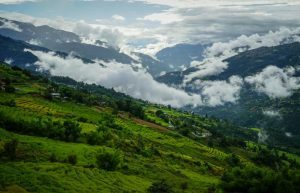 The drive to the Merak trail head is about three hours from Trashigang. The views are breathtaking. Ascending slowly through the mountains, you pass small, quaint villages and hills completely transformed into golden rice terraces. The further you drive, the more remote it becomes. 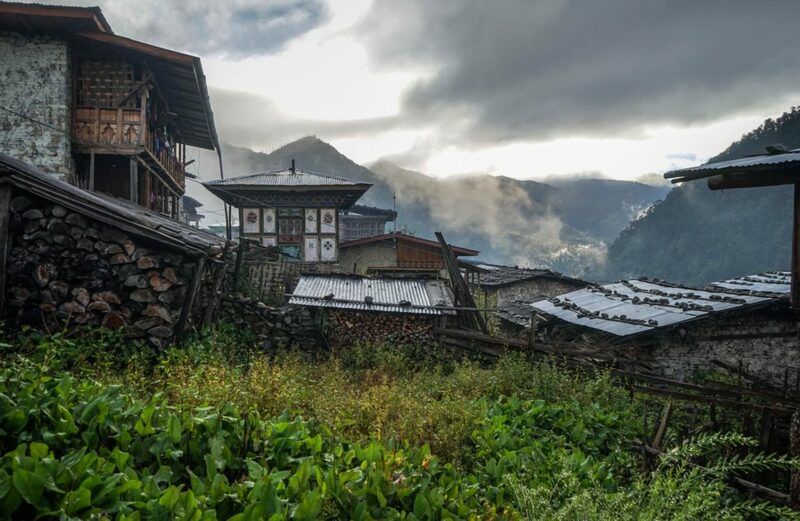 Farmlands are replaced with forests, as are traditional Bhutanese houses with wooden huts. After one hour, the road turns off to Merak. The pavement, riddled with potholes, abruptly turns to gravel and mud. “Now you get your free Bhutanese back massage,” Sonam yells out, laughing. After another hour bouncing along this horrible road, we found ourselves with a dilemma. The road was completely washed out from yesterday’s rainfall. “How far is Merak from here?” I asked. “I have never been this far east, I am not sure,” Sonam replied with a shrug. We left our vehicle behind and began the arduous journey up the mountain. Sonam called our Merak contact to tell him we had started walking. Hours passed by and we kept climbing. Slowly, the trees disappeared and we broke through the cloud layer. 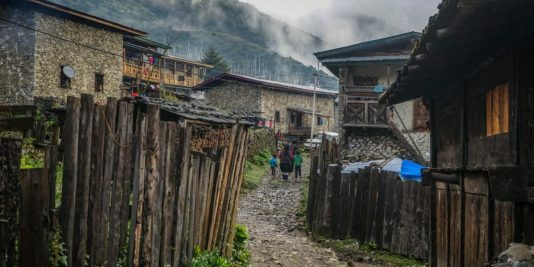 The bare hills were dotted with Brokpa settlements. Every so often, a curios Brokpa nomad would approach us and try to communicate with us. Finally, we found ourselves in a small community. 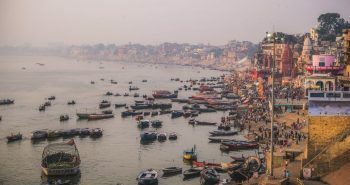 Sonam contacted our Merak Guide to inform him where we were. The look on Sonam’s face gave me a bad feeling. 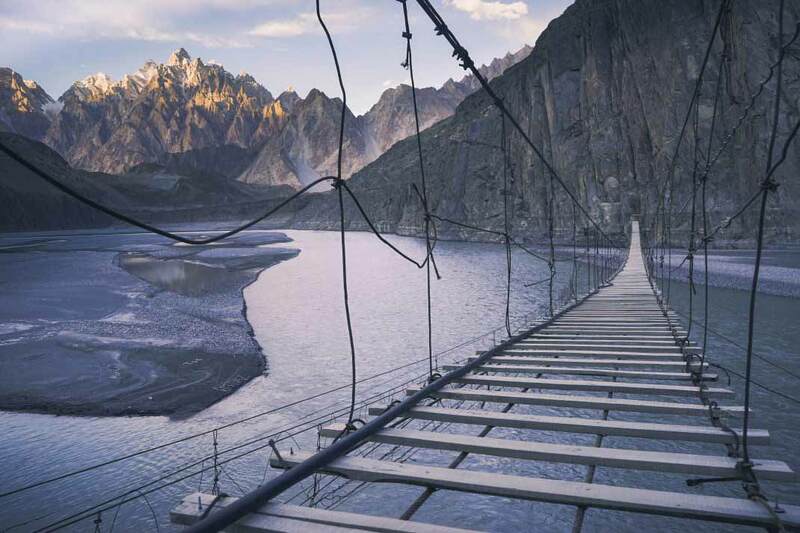 “He says we have another 20 km to Merak,” Sonam said, with a disheartened look on his face. So we did what any desperate traveler would do; sulk and keep moving. Desperately in need of food, our guide from Merak met us another 10 km up the road. The simple tea, rice and spinach we were provided felt like a meal for kings. Our Merak guide, Singey, led us over the prayer flag covered mountain pass and into the Valley of the Yeti. 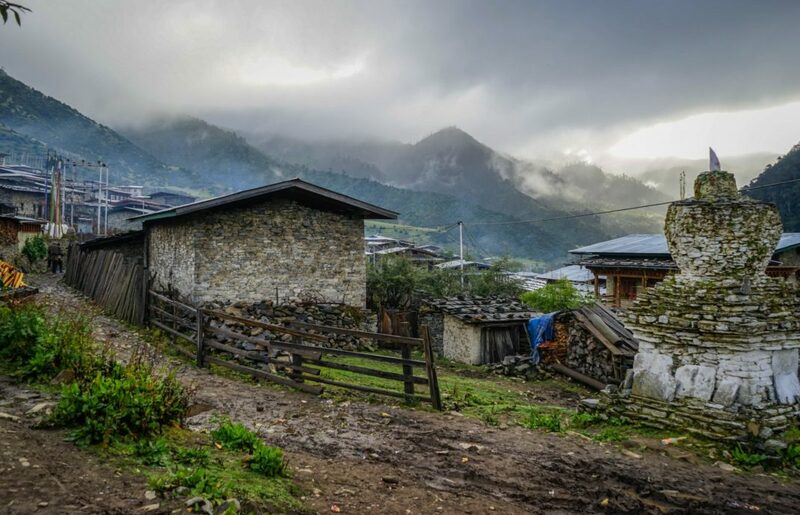 Daylight was fading when we approached the entrance to Sakteng Wildlife Reserve. At the entrance is a sign that says “Welcome to the land of the Yeti.” With about 4km left to go, it soon was completely dark out. 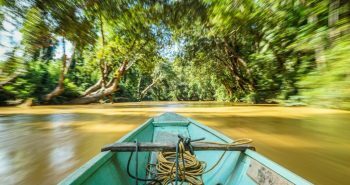 We navigated through dark forests and roaring (freezing) rivers, all the way to Merak. 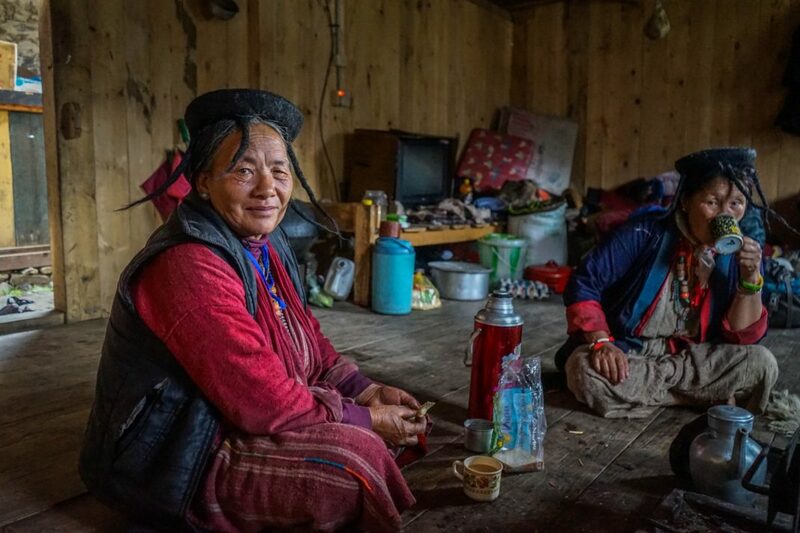 Singey’s father and mother met us with yak butter tea and showed us to the farmhouse. 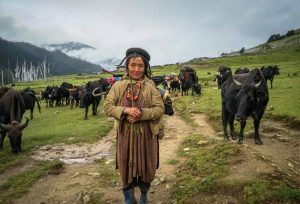 Singey’s mother was dressed in traditional Tibetan clothing and jewellery. 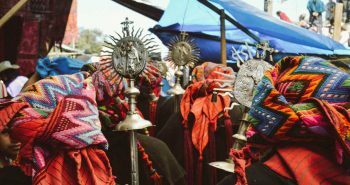 She wore atop her head the traditional Brokpa hat, which looks like a hairy black spider. 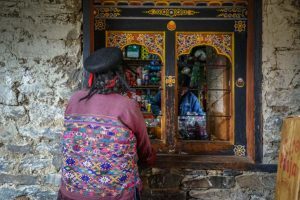 Easy to identify because of their Shamo, a wool hat that resembles a spider, the Brokpa have resided in Bhutan for centuries. They hail from Tshona, in southern Tibet, and number over six thousand now. 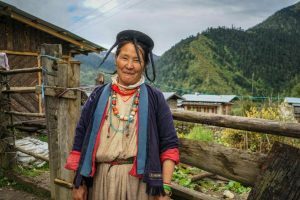 The Brokpa are distinctly different than other ethnic groups around here and the rest of Bhutan. Both men and women wear the Shamo hat. Their clothing is also quite remarkable. Men wear a thick, red, wool coat called a Tshokan Chuba. The women wear a red and white striped dress called a Shingkha. 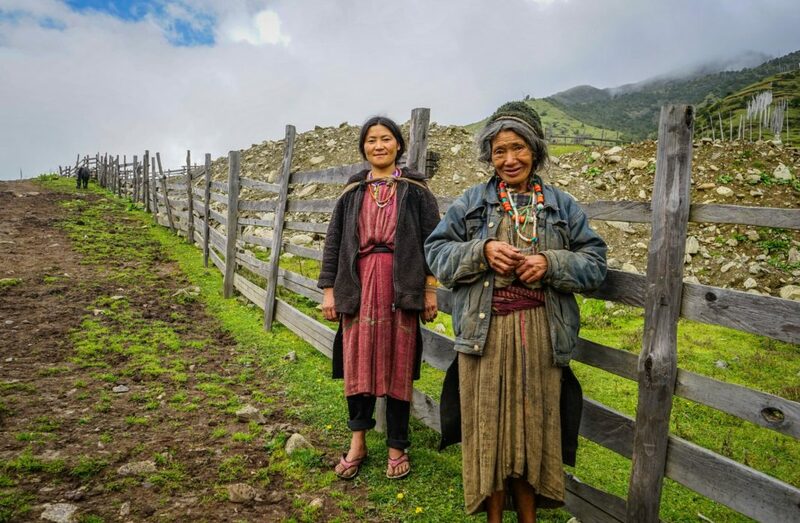 The women are often adorned with Tibetan amber and silver. 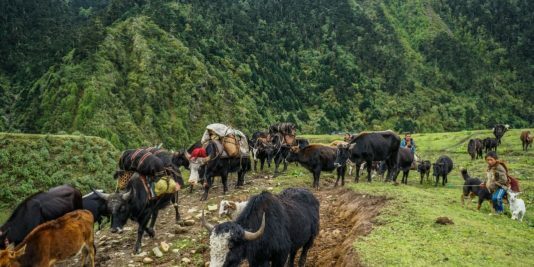 Many of the Brokpa are still nomadic, moving with their yaks. 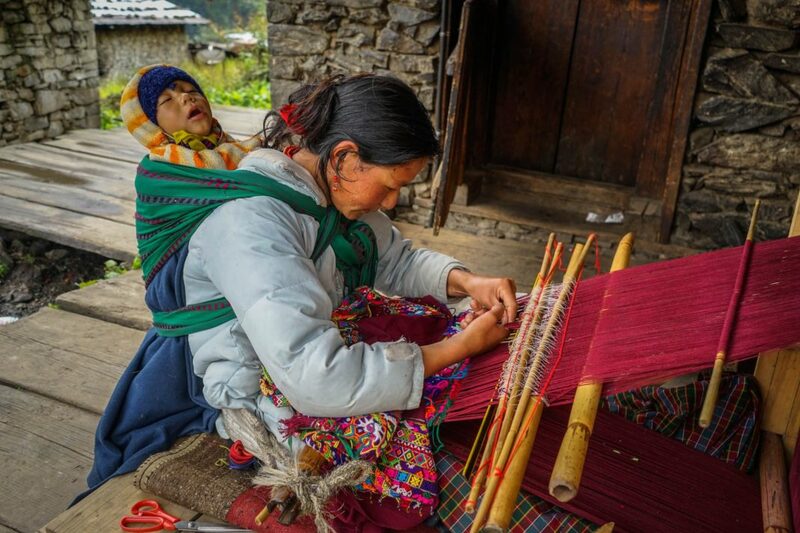 They often still use the barter system and trade with Bhutanese villages at lower altitude. 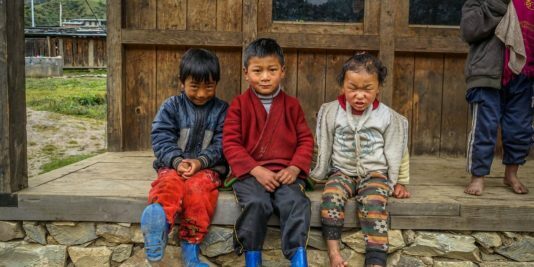 However, many younger Brokpa are becoming educated in Thimphu and are opting to be mountain guides for visitors exploring the area’s remote valleys and trails. 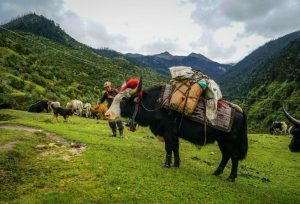 Yaks are essential to the Brokpa’s way of life. 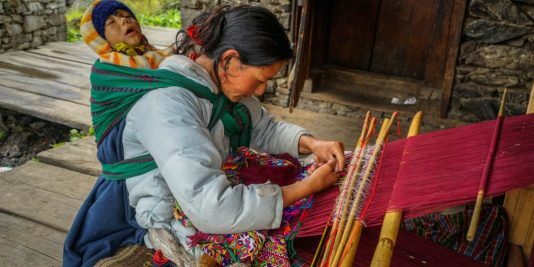 You will see both men and women spinning yak wool during the day. They use the wool for clothing and bartering. The Shoma is made from yak wool. 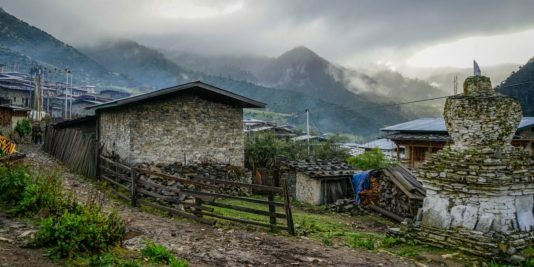 When you enter a home, the first thing you will notice is the piles of fermenting yak cheese. The Brokpa never have a meal without this delicious, salty cheese. They also use it for bartering in the lowlands; their cheese is superior to anyone else’s. Early the next morning, I awoke, slightly disoriented. The previous day’s hard walk was probably to blame. When I opened the door to go outside, I was in shock. Clouds rolled down dark, forested mountains. 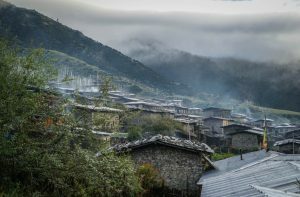 Mist and smoke rose from the roofs of beautifully made, traditional houses. 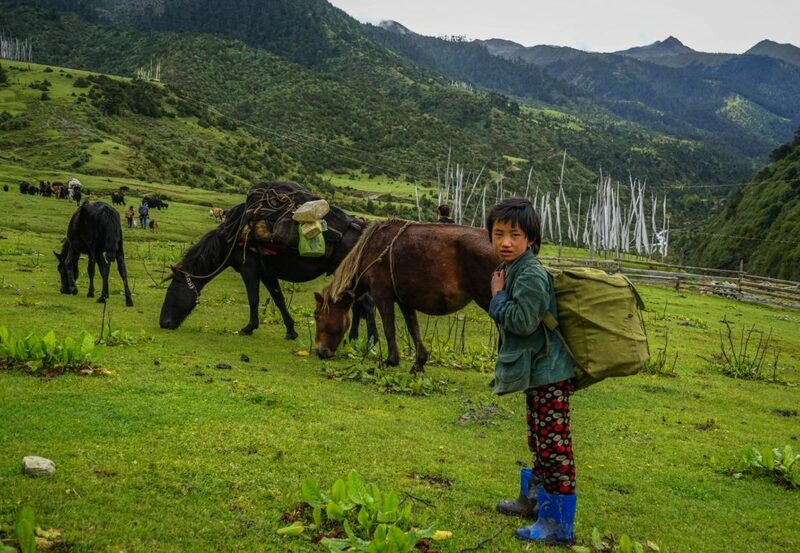 Locals, adorned with animal skins and traditional clothing, went about doing to their chores. The scene was blissful and stunning. Arriving late at night, I had been unaware that I had arrived in such a truly untouched part of the world. Alone, I spent the morning walking around the village. The curious locals, smiling and always willing to have their picture taken, took up much of my time. 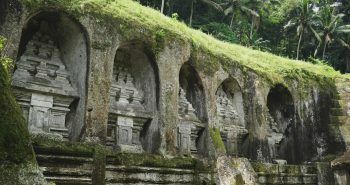 Merak is situated on the side of a hill leading down to a strong river. Atop the hill is a Buddhist temple and hundreds of prayer flags. The town is made up of about thirty or so wooden houses scattered around the hill. 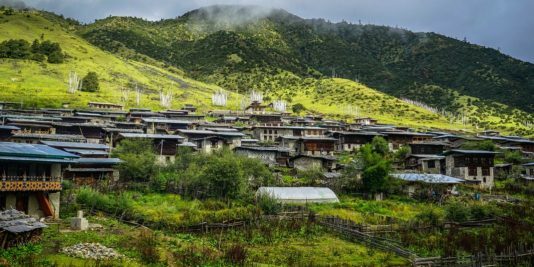 The surrounding area is composed of pastures plentiful with yaks and Buddhist Stupas. At lunch, I met up with Sonam. We were served more local delicacies. 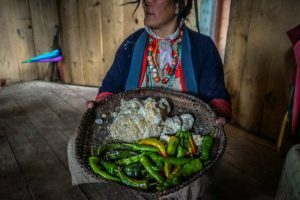 One dish I enjoyed, in particular, was a whole chilli sliced down the middle and stuffed with locally, made fermented yak cheese which was then roasted over a fire. No meal here is complete without Soucha*. 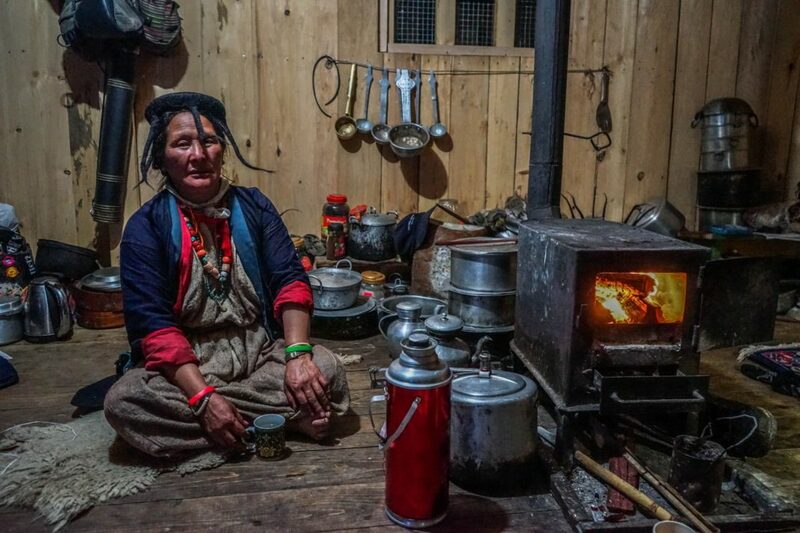 *Soucha – In Bhutan, the traditional drink called Soucha is often served at high altitude. It is made from yak butter and tea. 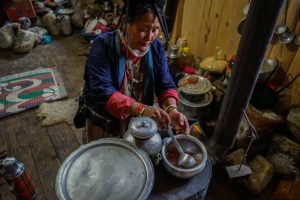 They place the yak butter and freshly made tea into a large wooden cylinder in which they mix the drink. After mixing it with a long stick for about five minutes, it is served. Soucha is not for everybody. It’s more of an acquired taste. Its salty, buttery and, in my opinion, delicious. After lunch, Singey’s mother dressed us in traditional Brokpa clothing. The men’s outfit consisted of a thick heavy red wool jacket which is held together with a colourful belt on the waist, and another wool strap flung over the shoulder. 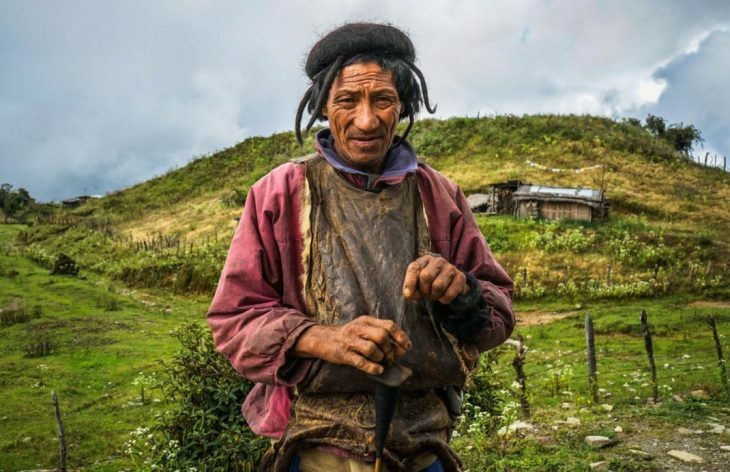 The hairy, black, woolen spider hat is also an essential component of the Brokpa outfit. The purpose of the hat is still a bit of a mystery to me, but, as far as I know, the spider leg strands help draw the rain away from your head. Sonam also opted for the camouflage rubber boots that many of the locals wear. 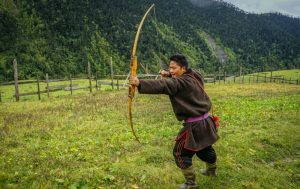 Singey took us to the yak pasture to attempt some archery. Sonam, who had previously told me that he had a fear of archery due to a childhood mishap, was, by far, the most accurate of all of us. While I was losing horribly at archery, we noticed a group of nomads crossing the southern part of the valley. 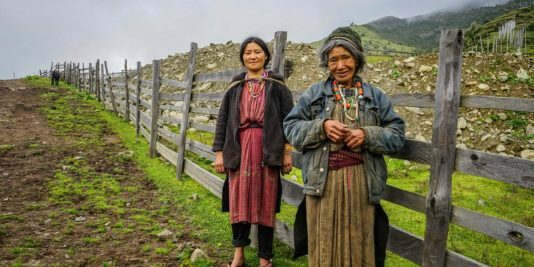 Singey brought us over to meet them, as I was very interested in meeting true nomads. The nomadic group consisted of a small family of seven. They wore deer skins and yak wool, and carried wooden baskets. 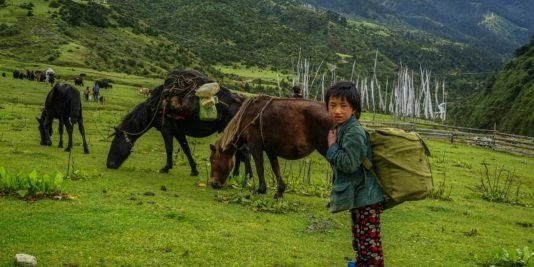 Their heard of colourfully dressed yaks were bearing the many parts of their home. The father, who happened to be fairly intoxicated, offered us a traditional drink called Ara*. *Ara – Made from wheat, this strong, distilled beverage is the national drink of Bhutan. It is served in a red, wooden cylinder to new guests. 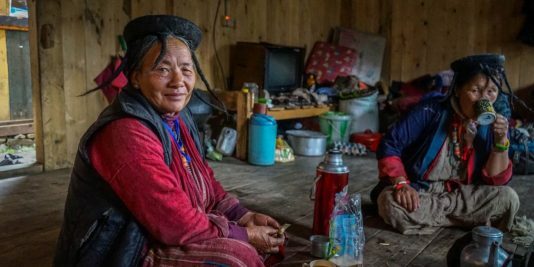 In East Bhutan, it is often given to anyone who enters your home rather than tea, like in the West. In Merak, Ara is combined with yak butter, giving it a strong, buttery flavour that I’ll never quite forget. The nomads pushed on down the valley disappearing just as quickly as they had come. From here we visited more of the town before ascending one of the hills covered in prayer flags, high above Merak. From here we could see all of the valley (still no Yetis, though). In the evening, we drank buttery ara, ate incredibly fiery food and enjoyed the company of our wonderful host family. We were all gathered in a shed, where the family aged their yak cheese. So, as you can imagine the scene, (and smells) were rather amazing and exotic as hell. The next day, we said our goodbyes to the family. Almost in tears, they told me they felt so fortunate and happy to have had a traveler come here. 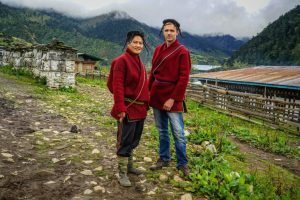 To visit them, eat their food, drink their weird beverages, and learn from these incredible and remote people. I’ll never forget this family and what an impact they had on Sonam and me. The trail to Sakteng continued just as it had before; straight up the mountain. 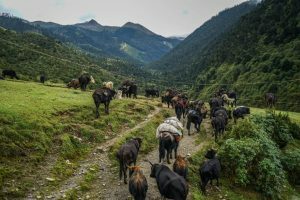 As we climbed once again, the trees disappeared and were replaced with yak pastures. 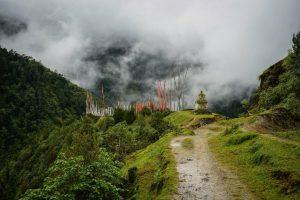 The trail followed a line of White Stupas that guided us onward. After three long hours of hiking, the terrain levelled out, providing stunning views of the valley and mountains. Another couple hours up the trail is the camp site. 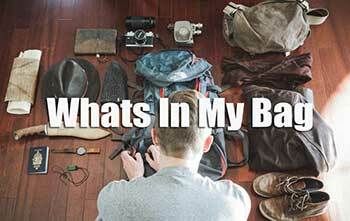 The weather here is very cold and unpredictable, so make sure you dress warm and are ready for anything. Singey conjured us up some mountain cuisine, which was incredible, considering the lack of equipment he had. The next day, we began to descend down the mountain through some dense forest. 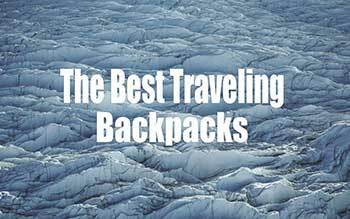 Here, if you are lucky (I was not), you can spot red pandas and snow leopards…….. and Yeti’s. 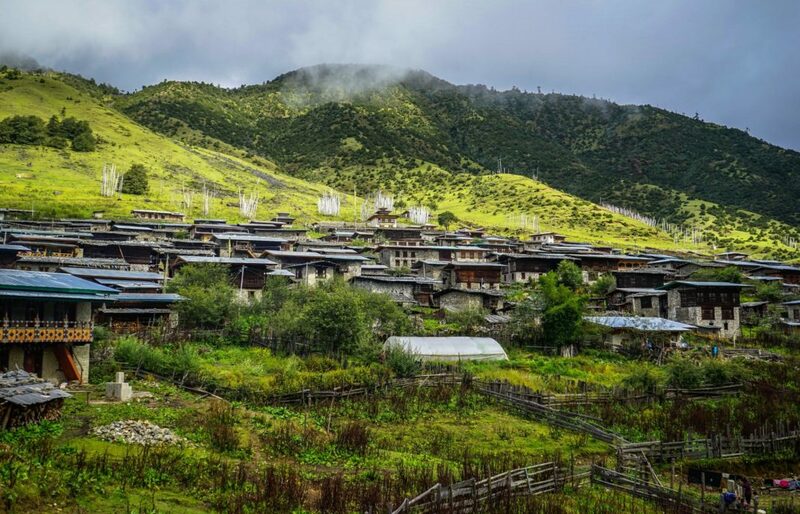 Hiking at a reasonable pace you will make it to Sakteng in about four or five hours. Sonam and I are quite able hikers, competing the descent in about three hours. 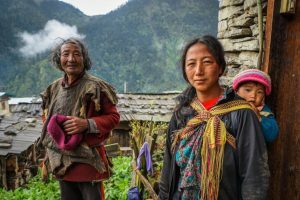 From Sakteng, we hitch hiked back down to Ranjung, where we met our driver. 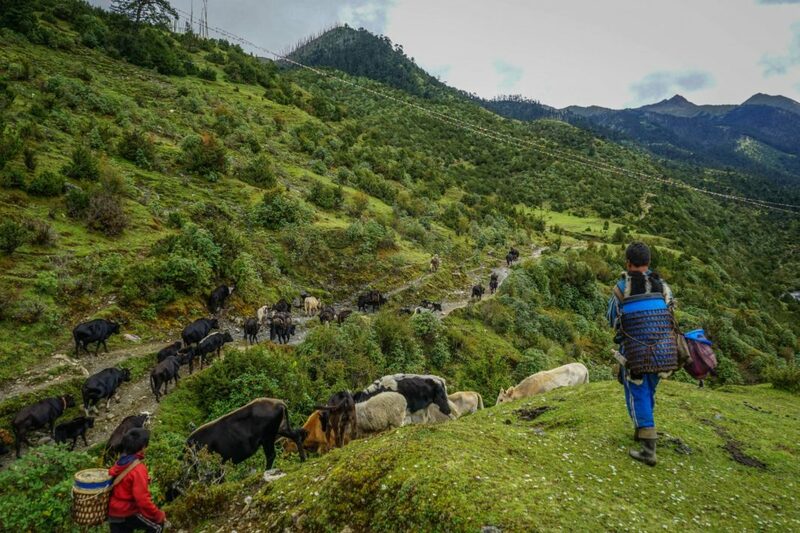 The Merak to Sakteng hike can take anywhere from 3 – 5 days, depending on you. 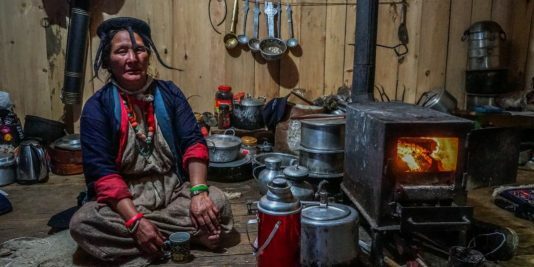 The highlight for me was definitely my stay with the Brokpa family in Merak. 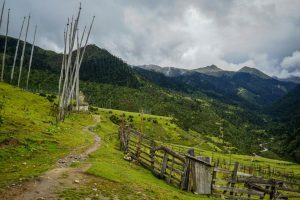 This hike is more of a cultural experience, rather than being purely about the scenery (scenery is still amazing, though!). The hike itself is not too hard, but challenging weather can cause it to be difficult at times. 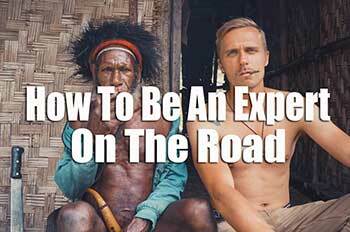 Come prepared and you will experience one of the most remote and special corners of the world. 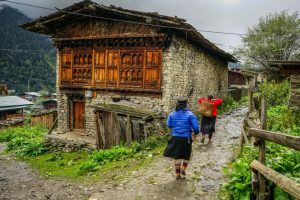 If you want to travel in Bhutan, you must do so via Tour Company. Many people don’t like the idea of this, but I can tell you honestly it is a worthy endeavor to visit here! 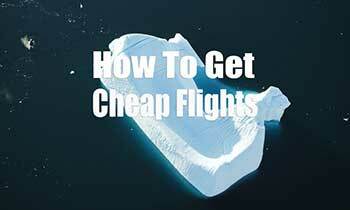 Because of this unique travel situation, Bhutan has numerous travel companies. Druk Asia happens to be one of the most successful companies. Why do I like Druk Asia? 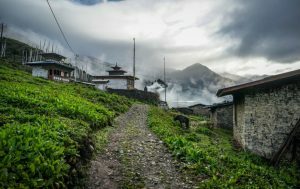 Druk Asia is one of the few companies that will completely tailor a custom trip to Bhutan, just for you. 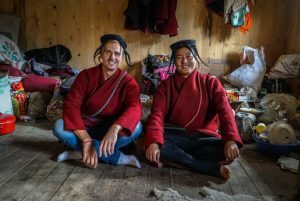 Their guides, who are all quite experienced, can arrange just about anything for you; whether its taking part in a Buddhist ceremony, or hiking to lost tribes in the East. Because of their flexibility and knowledge, Druk Asia, in my opinion, is the best option for travellers seeking to tour Bhutan. 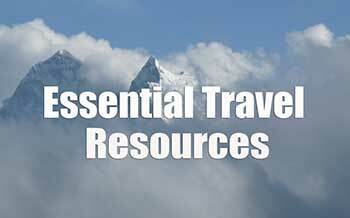 If you are interested in traveling to Bhutan, send Druk Asia a message. Feel free to ask me any questions about my tour into the Land of the Thunder Dragon with Druk Asia! Sonam Wangchuk was born in the Punakha region has been a guide with Druk Asia for almost seven years now. 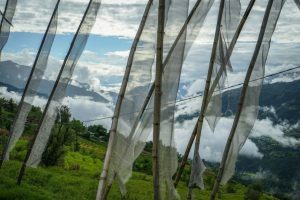 Sonam guided me for my first, fifteen day trip to Bhutan. 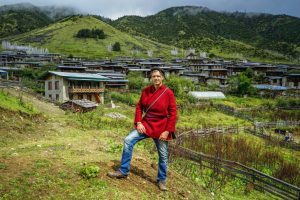 His years of experience were reflected in his skill explaining the history, culture, and the way of life in Bhutan. Sonam was raised in Bhutan. 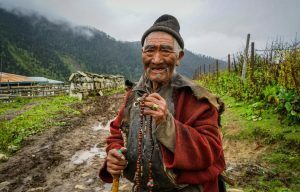 His wealth of knowledge with the traditional way of life in Bhutan is unmatched. Sonam was the sole reason my trip to Bhutan was so memorable. I will never forget his dry Bhutan jokes and lengthy history lessons. Sonam was my guide, but now I truly consider him my friend. If you are planning on making a trip to Bhutan and want an in depth, exciting one, then contact Druk Asia and ask for Sonam. Thank you, Sonam. 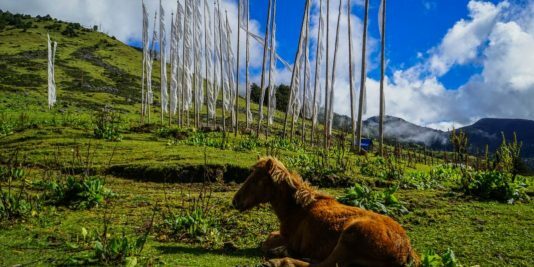 I cannot wait to return to Bhutan and have a Druk beer with you! Tips: Dress warm, it can get very cold here! We saw snow on the way to Sakteng! Don’t be shy, try everything! Have a taste for spicy food, the food here is very spicy. I think came to my mind after a glimps of looking you article, it really has amazing pictures! I dunno how you did it but it really cought my eyes! 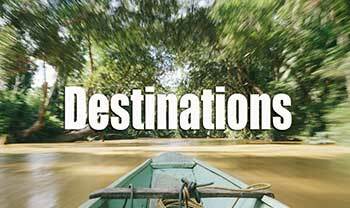 Undoubtly, this is undiscovered destination not many people know about this place. I really need to go to Yeti someday. 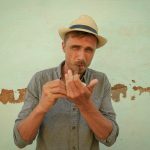 Thank you so much for this entertainig article. Please keep writing great article.. Thank you so much for reading! I agree you need to head there. 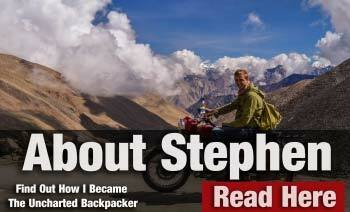 oh Stephen, what a beautiful country and what a wonderful review! 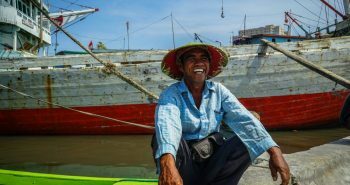 thanks to your detailed and interesting descriptions and your amazing photos you make possible for us to travel to this country just by watching all these on the screen. a huge thanks for this!